How Do We Know Our Solar System Formed from Stardust? The solar nebular hypothesis is a widely used theory to explain how our solar system formed. By assuming a giant gas cloud condensed to form our solar system the project will then explore where the cloud came from. Assuming the cloud came from and is made up of star dust, which creates the fuel for the solar nebula. To provide supporting truth to this statement the research project will explore the work Cecilia Payne and Arthur Eddington. Part 1 with explore solar system formation from a giant gas cloud in the solar nebula theory; part 2 explains where the fuel from the nebula came from (star dust) and how stars generate heavy elements from hydrogen atoms; and part 3 is understanding the science that justifies these theories. Solar Nebula Theory: the hypothesis that our planets were formed in rotating disks of dust around young stars. Specifically, the earth and other planets in our solar system formed in a disk of material around the Sun as the Sun condense from a cloud of interstellar gas and dust. As such, if the solar nebula theory is correct planet formation should be a natural part of star formation and most stars have planets. Condensation: the growth of a particle by adding material (one atom or molecule at a time) from surrounding gas. Condensation Sequence: a sequence where different materials condense from the solar nebula at increasing distances from the sun. The Planets: the variation of density amongst the planets is a great explanation of how our solar system is formed from a giant dusty nebula. Note, the four inner planets are small and have a high density and are called the terrestrial planets (earth), while the farther planets are large and have a low density and are called the Jovian planets (jupiter). The fascinating pattern of density among the four terrestrial planets is only revealed when the observed density is converted into uncompressed density; Earth and Venus are much larger and therefore have stronger gravity and higher densities, which is why we can’t see the pattern. An uncompressed density is what the planet’s density would be if gravity didn’t compress it. The inner nebula (close to the Sun) where the temperatures were 1500 K only materials that could form grains were compounds with high melting points like metal oxides and pure metals. These materials are very dense. In the mid nebula (further out) was cooler and silicates or rocky material could condense with the metal. Mercury, Venus, Earth, and Mars are composed of a mixture of metal, metal oxides, and silicates. The planets close to the sun have more metals and the planets further show more silicates. In the outer nebula (even further out) there is a boundary called the frost line where water vapor can freeze to form icy particles. Along with water, methane and ammonia would create a blizzard of ice particles and mix with smaller amount of silicate and metal particles to condense and lead to the lower densities of Jupiter, Saturn, Neptune, and Uranus. The condensation sequence explains how the different materials would condense from the gas as a reaction to the nebular temperature. True or False: The matter in the solar nebula was sorted by density with heavy rocks and metals falling in towards the sun and low-density gases being blown outwards. FALSE! When the solar nebula was hot enough to be entirely gas the chemical composition would be the same throughout the disk. LATER, as the disk cooled down, the inner nebula would still have high temperatures so only metal and rock could condense. In order to understand where the fuel for the solar nebula came from, it is important to examine the stages of the life cycle of a star, which results in the formation of the heavier elements that we find in our solar system. This “stardust” is thought to have been a part of our solar system since the beginning, when it was a diffuse nebula. -Nebula: a cloud of gas and dust in space. – Interstellar medium: gas and dust found in the spaces between stars. Interstellar dust: microscopic grains of dust, composed of elements like carbon, silicon, oxygen and iron. Molecular cloud: when a gas cloud cools sufficiently, the atoms can form into molecules creating a molecular cloud (not all elements can form molecules). particles in relation to the object’s temperature. -Protostar: A forming star which has not yet reached temperatures and pressures required for sustained fusion to occur in its core. these disks coalesce into planetary solar systems. -Convection: the energy transport process in which warm material expands. rises while cooler material contracts and falls to the centre. -Self -Sustaining Fusion: Fusion which occurs where the energy being created in the fusion process is radiated away at the same rate, effectively halting gravitational contraction, and bringing the star in equilibrium. With the exception of hydrogen and helium, many of the elements found in our solar system were not formed during the Big Bang, but were instead formed during the various stages of the life cycle of a star. By analyzing the processes by which these elements are formed, it possible to achieve a greater understanding of how solar nebula are formed, and how our solar system was formed as a result. In order to understand how stardust becomes fuel for solar nebula, it is important to examine the stages of the life cycle of a star that result the formation of the elements that we find in our solar system. 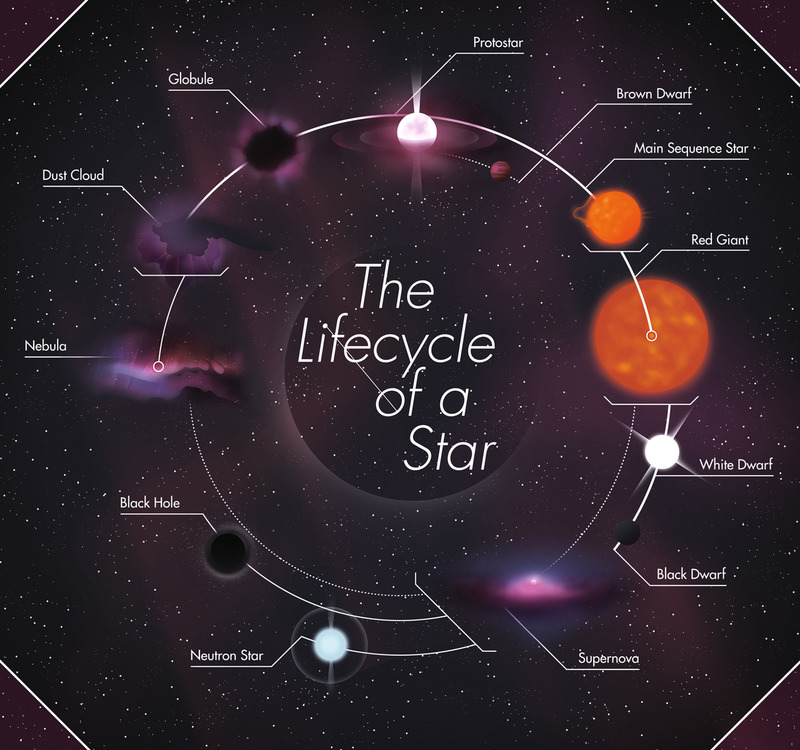 To understand the formation of the solar nebula, we need to understand the life cycle of a star. Stars are born in an area of high density Nebula, by condensing into a large globule of gas and dust that contracts under its own gravity. Specifically, they begin forming in cold and dense regions of the interstellar medium known as molecular clouds. The temperature of these clouds is between 10K and 30K (Kelvin) and have an average density of 300 molecules per cubic centimetre, which is almost a million trillion times less dense than the Earth’s atmosphere. Although this doesn’t seem dense enough to form into anything, it is far denser than empty space. These clouds consist mostly of molecular hydrogen (i.e. H2) since helium atoms do not combine with other atoms to form molecules, but there are also elements like carbon, silicon, oxygen and iron present in the form of interstellar dust, which will be discussed below. By overcoming the thermal pressure of the gas cloud, gravity causes the densest regions (often referred to as “clumps”) of these clouds to contract, coalescing into increasingly dense regions of interstellar gas and dust. The contraction also eventually results in the fragmentation of the clump from the gas cloud, caused by the dense regions of the cloud contracting (overcoming the thermal pressure) to the point that they break away. The contraction converts some of the clouds gravitational potential energy into thermal energy. Due to the opaqueness of the aforementioned interstellar dust within the cloud, this heat cannot be radiated away as fast as the heat is created by gravitational contraction. The object that results is an increasingly hot and dense molecular mass called a protostar. Convective contraction The protostar surface temperature remains near 3000K while convection is the dominant form of energy transport. Gravitational contraction continues increasing the core temperature. The reason the core temperature rises while the surface temperature stays constant is that the energy at the core rises until it reaches the layer at which the photons can escape to space. This layer is 3000K because at higher temperatures, the collisions that occur can strip electrons from hydrogen atoms creating positively charged hydrogen ions, which absorb light photons better than neutral charged hydrogen atoms (which occurs at 3000K). Radiative contraction The primary energy transport moves from convective to radiative diffusion. This is done as the contracting protostar’s core becomes hot enough to strip almost all of its atom’s electrons, making it easier for radiation to flow freely through the star’s interior. Surface temperature begins to increase, up to about 5000K. During this stage, the protostar releases about half of the thermal energy it gains from contraction. If this did not occur the thermal pressure would balance out the gravitational contraction before nuclear ignition could occur. Hydrogen nuclei begin to fuse into helium nuclei, but the amount of energy released by the process is small compared to the amount radiated away. Thus, fusion is non self-sustaining at this point. Self-sustaining fusion Gravitational contraction continues, increasing the core temperature to between 10 and 15 million K. At this point there is sufficient temperature and pressure to achieve a fusion rate that balances with the rate which energy is radiated away. Equilibrium is achieved as the thermal pressure matches gravity. The result is a self-sustaining fusion process. At this point, the protostar becomes a star. Once a star begins the self-sustaining fusion process, the energy it generates balances the energy it radiates into space, and the internal pressure of the star becomes stable. Once equilibrium is achieved it is called a Main Sequence Star. Mass plays an important role in the life cycle of each main sequence star. A star with a higher mass comes into equilibrium at a much higher temperature than a lower mass star; thus, fusion energy is released at a much higher rate. Because of this a higher mass main sequence star will consume hydrogen at a much higher rate, resulting in a shorter life despite having a greater amount of hydrogen to fuse. A star with 8 solar masses or more, is considered a high-mass star. Stars of this mass behave in a similar fashion to a low mass star in the early stages of life, with the exception of a much faster rate of fusion. Once the core hydrogen is spent, the paths of a high-mass and low-mass star diverge, as a high mass star continues to fuse heavier elements in its core due to higher core pressures and temperatures which result from higher mass. The life cycle of a high-mass star continues as summarized in table 1.2. Red Super Giant After the core hydrogen is exhausted, the core shrinks and temperature rises. Hydrogen begins to fuse in a shell around the helium core (helium is the result of hydrogen core fusion), pushing the outer layers of the star out due to increased thermal energy. Helium- core fusing supergiant Once the core temperature becomes hot enough to fuse helium into carbon, helium core fusion begins. The core expands, hydrogen shell fusion slows and the star’s outer layers shrink. Multiple shell fusion super-giant As the process continues the star begins to fuse many different elements in shells around an iron core. 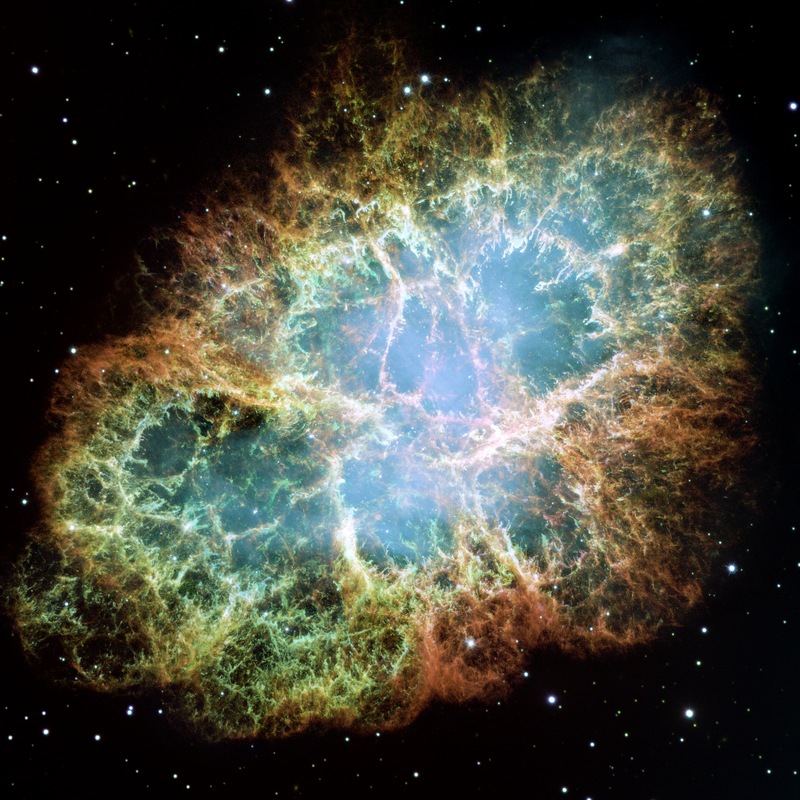 Supernova Iron cannot provide fusion energy, so as the heaviest element in the process, it accumulates in the core until fusion ceases. Once this happens, outward thermal pressure ceases. Gravity becomes the dominant force, allowing the outer layers of the star to collapse inward, starting a chain reaction creating the rest of the elements. The collapse halts once the outer layers reach the central core of neutrons and violently bounce back, sending the elements created in the fusion process out into space to become the ingredients for the birth of next generation stars. Parts 1 and 2 have discussed the processes behind solar nebula theory, but it is important to examine how the theory was devised in order to understand how the scientific community came to regard it as the most plausible theory. Examining the work of Cecilia Payne and Arthur Eddington is they key to understanding how the scientific community knows this information is true. produce were simply the result of differing ionization levels of emitted atoms, which were caused by each star’s temperature rather than its different chemical composition . For example, she showed that cooler stars, like those designated as an M, showed strong molecular absorption lines because they are cold enough to form molecules, whereas a star designated in the O category was so hot that almost all the hydrogen is ionized, resulting in weak hydrogen lines in its spectrum[ix]. In contradiction to the popular scientific view of the time, her work essentially came to the conclusion that the Sun was composed of primarily hydrogen and helium, and that the sun and the planets have different material compositions. This lead to a greater understanding of the nuclear processes which form the heavier elements through fusion of abundant hydrogen, and was one of the first steps towards an explanation of how these heavier elements found their way into our solar system as star dust from dying high mass stars. These discoveries are important to solar nebula theory because they provide evidence of the material and the quantities of which the solar system consists, and in conjunction with processes such as star formation from molecular clouds, rotation, condensation, and clearing the neighbourhood, this evidence supports the solar nebula theory as it is known today, and outlined above. Along with Cecilia Payne’s work, astronomers required an understanding of the thermodynamics of the interiors of stars before they could sort out the process of core hydrogen fusion. This understanding was provided by Arthur Eddington, was a British astronomer, physicist and mathematician. His main focus in astronomy was the interior workings of stars. He developed theories, based on Karl Schwarzschild’s earlier work, which stated that the star, a sphere of gas, was using its own thermal pressure to withstand gravity. Based on this Eddington developed the first understanding of the stellar process and the internal workings of a star. His results allowed the calculation of the temperature, pressure and density of any point inside a star. Eddington thought this would be extremely helpful for further research into stars, because despite not being based on entirely accepted physics, it would still give accurate results. In 1924, Eddington discovered the Mass-Luminosity relationship for stars. [i] M.A. Seeds and D.A. Backman, The Solar System, 9th Ed. (Centage, Boston, MA, 2016), pp. 205-207. [ii] Dimitris, The “Clearing the neighbourhood” Formula, WWW Document, (http://www.fxsolver.com/blog/2015/10/21/clearing-neighbourhood-formula/ ). [iii] A B Cryer, Clearing the Neighborhood Explained, WWW Document, (http://everything.explained.today/Clearing_the_neighbourhood/ ). [iv] Dimitris, The “Clearing the neighbourhood” Formula, WWW Document, (http://www.fxsolver.com/blog/2015/10/21/clearing-neighbourhood-formula/ ). [v] J. Bennet, M. Donahue, N. Schneider, M. Voit, The Cosmic Perspective, 7th Ed. (Pearson, Boston, MA, 2014), pp. 510-565. [vii] J. Bennet, M. Donahue, N. Schneider, M. Voit, The Cosmic Perspective, 7th Ed. (Pearson, Boston, MA, 2014), pp. 510-565. [ix] J. Bennet, M. Donahue, N. Schneider, M. Voit, The Cosmic Perspective, 7th Ed. (Pearson, Boston, MA, 2014), pp. 494-495.